Any student who followed the green footprints in LaFortune Student Center ended up at this year’s Sustainability Undergraduate Research and Education Expo hosted by the Campus Coalition on Research and Education for Sustainability (CREST). 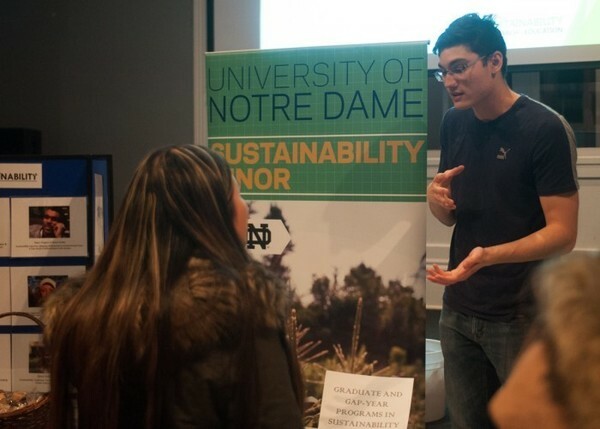 This is the third annual event for the coalition, made up of the Environmental Change Initiative, the John J. Reilly Center, the Center for Sustainable Energy at Notre Dame (ND Energy) and the sustainability minor, through which students found various opportunities for getting involved with sustainability on campus. “We hope students can get a better understanding of sustainable practices across campus,” managing director of ND Energy Ginger Sigmon said. As a result, the Expo brought together groups and organizations dealing with research, education, outreach, internships and resources, according to Sigmon. While most groups are Notre Dame-affiliated, there are a few external groups. This variety attracts students with all types of interests, she said. Freshman political science major Bennett Rogers attended the Expo to gather information, as he is looking into a minor in sustainability. Freshman Tommy Jegier said he came to the Expo because he is looking into a minor in energy studies, and because he was inspired by his earth focus class to learn more about sustainability. According to sophomore Student Energy Board member Tansy Wang, students are encouraged to look at ways to be sustainable outside of research. Wang said the Board aims to emphasize ways to get involved with sustainability and to make renewable energy more of a prominent resolution. Rachel Novick, director of the minor in sustainability, said the minor, which has a mix of students that represent a good make-up of Notre Dame students, is a good resource for students to learn more about sustainability and renewable energy. “The goal of the sustainability minor is to have students develop as leaders and make change in whatever field they go into,” she said. Originally published by Eliza Harris at sustainabilitystudies.nd.edu on February 01, 2017.